Gerhard D. Huebert: minister and teacher; born 18 April 1906 to David Huebert and Helena (Martens) Huebert in Margenau, Molotschna Mennonite Settlement, South Russia. He was the seventh child of his father’s fourth marriage and the second youngest of 19 children in the family. Gerhard married Katharina (Katie) Willms of Namaka, Alberta on 26 October 1933; the couple had three sons, all of whom survived childhood. In 1980, he was hospitalized due to failing health, and after a series of strokes, he died at Concordia Hospital in Winnipeg on 12 May 1981. Gerhard grew up in Margenau, Molotschna Mennonite Settlement, South Russia. Gerhard’s mother died early in 1913, when Gerhard was only six years old. He began his education in the local school in Margenau, but after his father’s death in 1917, he was sent to live with his older siblings and half-siblings. Over the next nine years, he lived in three different homes and attended five different schools. Meanwhile, Gerhard was converted at age 13 and baptized at 16, joining the Alexanderthal Mennonite Brethren Church, where he worked with the children and preached in Sunday services. In October 1926, he and his siblings immigrated to Canada and settled first in Saskatchewan before moving the next year to Sedalia, Alberta, where Gerhard served as a minister in the Neukirchner Mennonite Church. Gerhard studied for a year at the Herbert Bible School in Saskatchewan and then for three years at the Calgary Prophetic Bible Institute in Alberta. He enjoyed music, and he joined an instrumental group in Herbert, as well as singing at various church events. 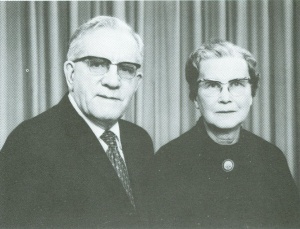 During his years in Calgary, he met Katie Willms, and the two were married on 26 October 1933 at the Namaka Evangelical Mennonite Brethren Church. In 1933, Huebert accepted an offer from Gem, Alberta, to help establish the Bethesda Bible School there. In summer 1938 the family moved to Toronto, where Gerhard attended the Toronto Baptist Seminary for three years. During the summer months Gerhard and Katie worked in Vineland, Ontario. In the fall of 1940 Huebert and his family moved to Hepburn where Gerhard began teaching at Bethany Bible Institute. Gerhard taught at Bethany for a total of five years, and served as principal from 1942 to 1945. During this time he also served as pastor of the Hepburn Mennonite Brethren Church for two summers. In the spring of 1945, Gerhard received an invitation to teach at the Mennonite Brethren Bible College (MBBC) in Winnipeg, Manitoba. Feeling the need to first pursue further training, he and his family relocated to Hillsboro, Kansas in the fall of 1945 so that Gerhard could complete his Bachelor of Arts and Bachelor of Divinity at Tabor College. After a year, he studied at Northwestern Schools in Minneapolis, Minnesota for two years to get his doctorate. The family moved to Winnipeg in June 1948 and Gerhard taught at MBBC for five years, serving as the head of the theology department and the dean of curriculum. Gerhard taught at the Winkler Bible School from 1953 to 1959, serving as principal from 1956 to 1959. From 1959 to 1969, he worked as an editor for the Christian Press in Winnipeg, and as a pastor at the Central Mennonite Brethren Church from 1970 to his retirement in 1974. He wrote adult Sunday school material for 27 years, and he was a member of the Manitoba Ministers and Deacons Committee for 15 years. With his health deteriorating, Gerhard was admitted to the Concordia Hospital in Winnipeg in October 1980. He stayed at the Donwood Manor Personal Care Home before a series of strokes necessitated his return to the hospital, where he died on 12 May 1981. The funeral was held on 15 May at the Central Mennonite Brethren Church. Gerhard D. Huebert was a dedicated minister and teacher, devoted to his church and his community. He used his many gifts to benefit his students and the church, leaving a legacy of commitment for future generations. Canadian Conference of Mennonite Brethren Churches. “Gerhard D. Huebert.” Web. 9 March 2010. http://www.mbconf.ca/home/products_and_services/resources/published_genealogies/personal_papers/huebert_gerhard_d/. Huebert, Art. The Life of Gerhard David Huebert: Living the Word. [Winnipeg: Art Huebert], 2006. Huebert, Helmut. "The Life of Katharina Johanna Huebert: By the Grace of God from the Cradle to the Grave." Winnipeg, 2003. Unpublished manuscript. Mennonite Brethren Herald (26 June 1981): 34; (8 June 2001): 28. Mennonitische Rundschau (17 Juni 1981): 34. Warkentin, A. and Melvin Gingerich, compilers. Who's Who Among the Mennonites. North Newton, KS: Bethel College, 1943: 122. Huebert, Susan. "Huebert, Gerhard D. (1906-1981)." Global Anabaptist Mennonite Encyclopedia Online. March 2010. Web. 19 Apr 2019. http://gameo.org/index.php?title=Huebert,_Gerhard_D._(1906-1981)&oldid=143075. Huebert, Susan. (March 2010). Huebert, Gerhard D. (1906-1981). Global Anabaptist Mennonite Encyclopedia Online. Retrieved 19 April 2019, from http://gameo.org/index.php?title=Huebert,_Gerhard_D._(1906-1981)&oldid=143075.